As a sweet treat this Valentine's I'm going to be reviewing Häagen-Dazs ice cream*. The tubs are perfect for sharing with a loved one and every mouthful is divine with the unique velvety texture and unforgettable taste. Häagen-Dazs have been making ice cream like no other since 1961 and are the UK's leading luxury ice cream brand. They have a wide range of delicious flavours and are stocked in all major supermarkets. Below are a selection of different flavours in my local supermarket. I decided to try Cookies & Cream and Chocolate Salted Caramel. Cookies & Cream is made with a combination of luscious vanilla ice cream and crunchy pieces of chocolate cookie. I really enjoyed the taste, the cookies were of high quality and came in big chunks. Chocolate Salted Caramel is a delicious combination of smooth chocolate ice cream with salted caramel swirl and salted caramel brittle. It tasted lovely and I would definitely purchase again. 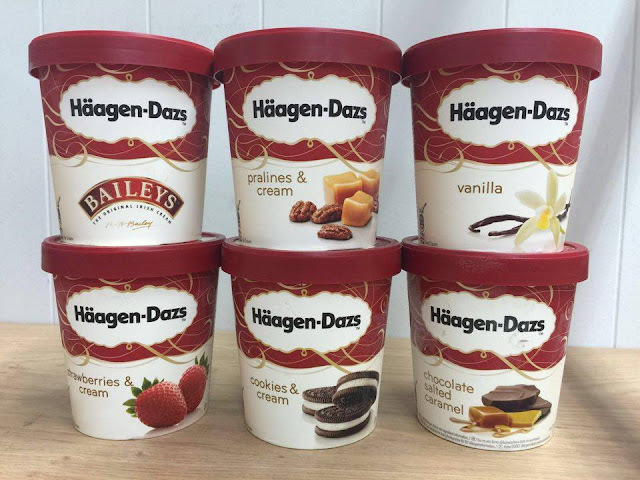 Have you tried Häagen-Dazs ice cream before? What's your favourite flavour? Artisan Salts from The Very Salt Co.